Documents filed with SEC show Hello Inc Raised $21M in funding in June 2015 as here. The Sense Sleep Computer is a crowd funded Kickstarter project that raised approximately $2.4M ending Aug 2014, designed by a San Francisco company called Hello Inc. The company have previously raised around $10M in funding. The Sense records sleep data using various MEMS sensors, and advises users on how to improve their sleep. Customer data is used to learn sleep patterns in conjunction with the sensor data, possible using machine learning algorithms. Up to 19,349 units have been shipped now to Kickstarter backers, who paid a minimum of $99 for the Sense + Pill. (Hello Inc paid for the extra duty and tax for all countries). There are more details on the web re this product,but below will mainly cover the hardware design. 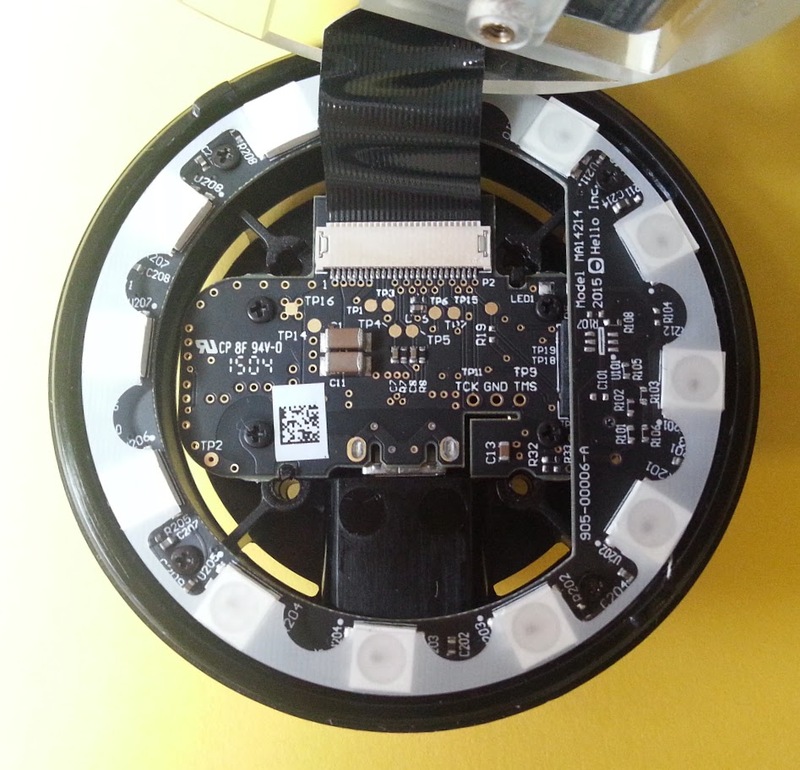 The main issue with the Sense is that, according to backers, a lot of the sensors don't work as per the Kickstarter campaign, major functions are missing and that the backers have been left in the dark. It is normal for a product design to change from a prototype build to production version but normally backers are told this. Kickstarter backers were not told by Hello that major features such as Pollen count, snore recording, etc were omitted. More details on this later. I have done a hardware teardown, and also used a digital microscope to resolve to around 50 micrometers to see many details not seen in normal hardware web teardowns, e.g. for mobile phones. I have done some Bluetooth and power supply signal analysis using 1Gbit samples/second digital oscilloscope. The Sense is beautiful on the outside a soft/hard enclosure that feels like chocolate. Sense is even more elegant inside re the electrical and mechanical CAD (customers don't normally see this, but my report show pictures ) but I am interested in the functionality. If you spot any errors please let me know as many components not identified yet. I will credit you. I have one on loan for hardware evaluation. Thank you Leon. First stage on receiving device was to load up Sense App for my Samsung Galaxy S3 (approved for use with Sense) phone from the Google Play store. Android customer response was interesting, up to 184 reviews to 24/7/2015, but with many bugs and lack of promised functionality reported. I installed the App on the Samsung Galaxy S3 phone. I tried around 10 times to pair with Bluetooth on my phone but the App could not find my Sense. I contacted Hello support and am waiting for a reply. Hello outsource the support issues to Zendesk.com. Hello have received on average around 180 support requests per day over the last few weeks. Below, my 2nd support request, exactly 24 hours later, and support request is now #18682, so 189 other customers requests added today. Update, I got a good and comprehensive reply from Hello support on 9.7.1015. The power supply board is in pieces so I need to reassemble to try pairing. 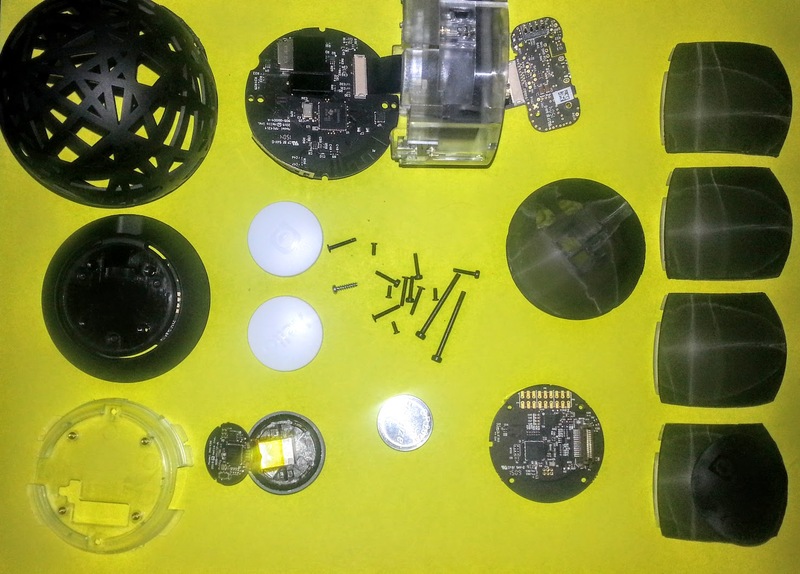 Update 2: Sense reassembled after photography, still won't pair even after following instructions from Support. Just a spinning purple light. I have now tried to pair an iPad Air, but same problem. Awaiting reply from support, who are very helpful. 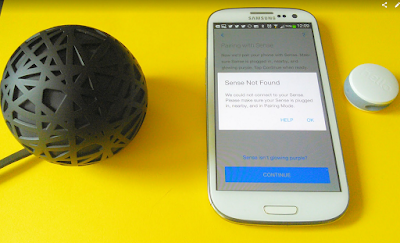 I spoke with Hello today re Bluetooth pairing issues. The Sense can broadcast to the iPad Air as seen in debug program below, but not pair with Sense App. Hello think that possible Bluetooth hardware is faulty. Sense is still paired with original customer's phone. I have annotated the image below from Blueprints. Below, block diagram of Sense. My main interest is to do a hardware teardown of the Sense to identify the major components. I can then check their specification and then see what the Sense is supposed to do as many Kickstarter backers have been left in the dark re the product's functionality. Hello do not provide a detailed technical specification. I am unable to take many power or signal measurements (e.g. 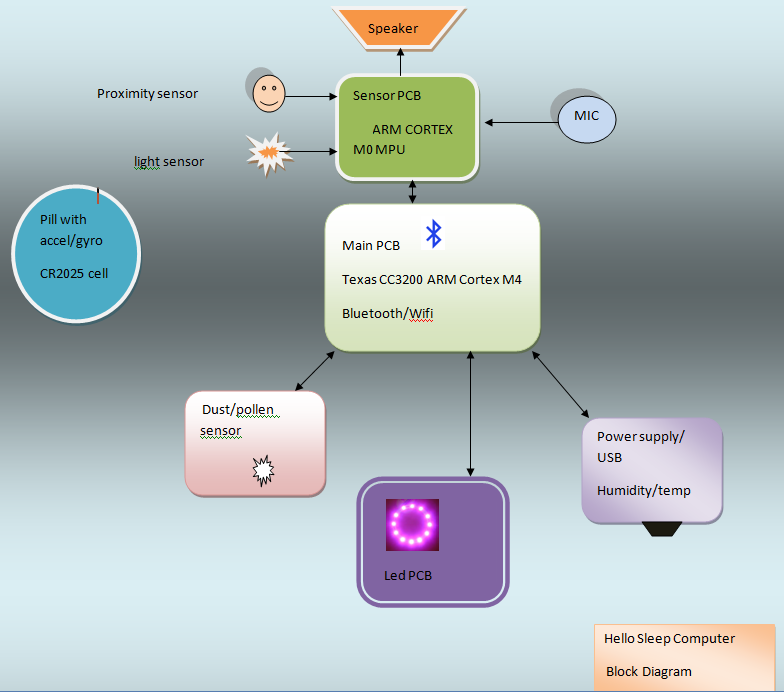 possible I2C serial data from the sensors) as the Sense will not function unless it can connect to my phone via Bluetooth, so waiting on a reply from Hello's technical support, who are fast and efficient. 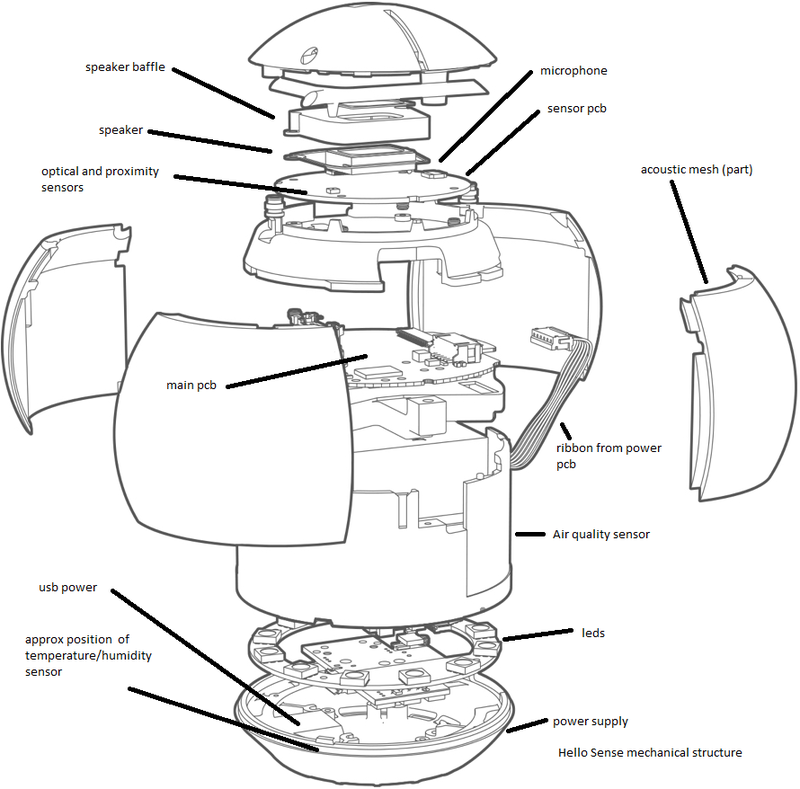 The first documentation for the Sense hardware appeared at the FCC site in April 2015. There are dozens of documents, e.g. internal photographs here. The confidential documents are now viewable. The Sense is an unusual electronic design for consumer use, all the circuits are fitted inside a sphere. This requires stacking 5 printed circuit boards (PCBs) on top of each other. This means numerous multiway ribbon cables, plugs/sockets and mechanical supports are required to connect all the logic circuits together. Extra cables are required to bring test points to the bottom of the unit. 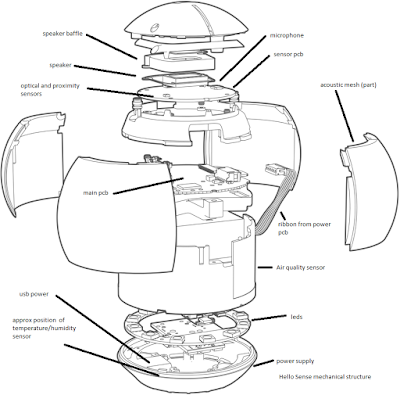 The sphere is not designed for repair, e.g. how to remove the "bird nest" outer case is a challenge. This is an expensive design. There are a total of 6 PCBs including the Pill. The Jabil factory, used by Apple, in China, builds the Sense. Most of the Sense can be dismantled using a hex screwdriver, however many parts are glued together. Test signals are provided on the bottom power supply PCB. 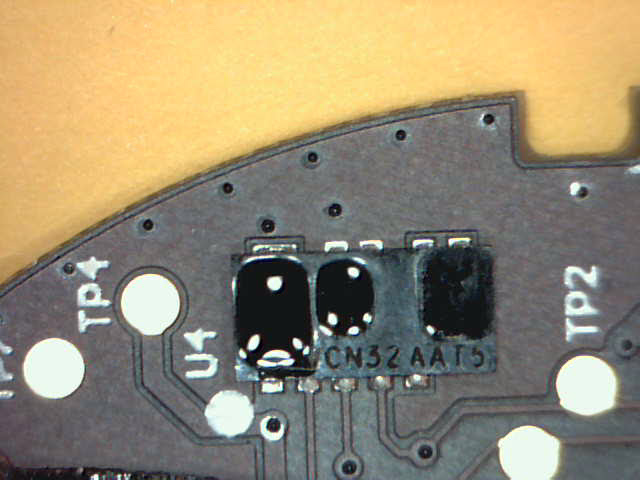 This black material wraps around all of the PCBs. It allows microphones and loudspeakers to pass audio but keeps out dust. See below image. 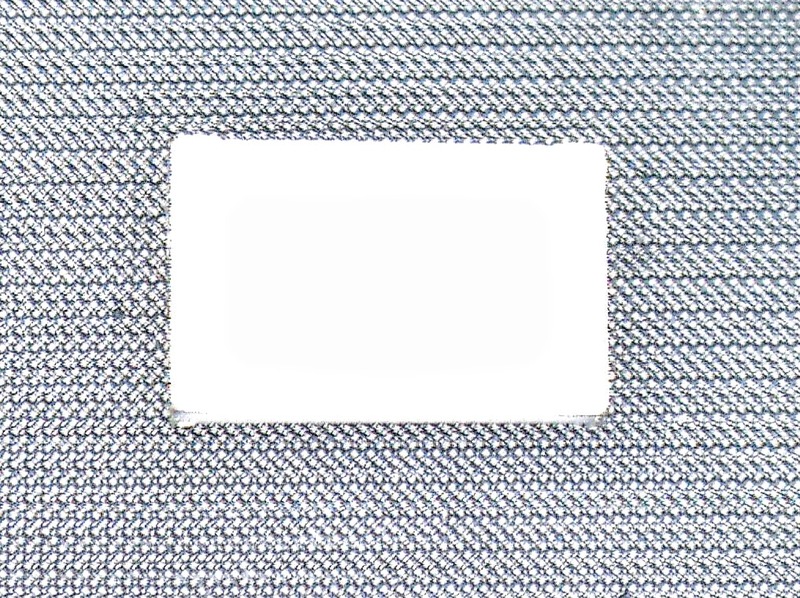 The silver SMD resistor is used for scale, it is approx 2mm (2000 micrometers) wide, covering 28 threads. That is around 70 micrometres per thread. My microscope resolves to about 50 microns (see end of post). 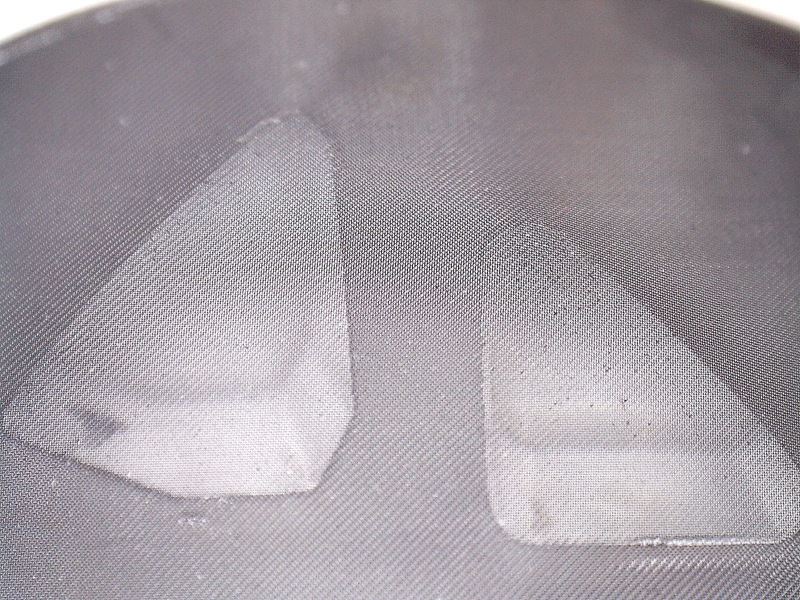 These apertures are important as may affect the AQ measurement with the dust sensor. There are a total of 3 ARM Cortex Microcontrollers in the Sense and Pill. This measures light, human proximity, audio and provides a loudspeaker. 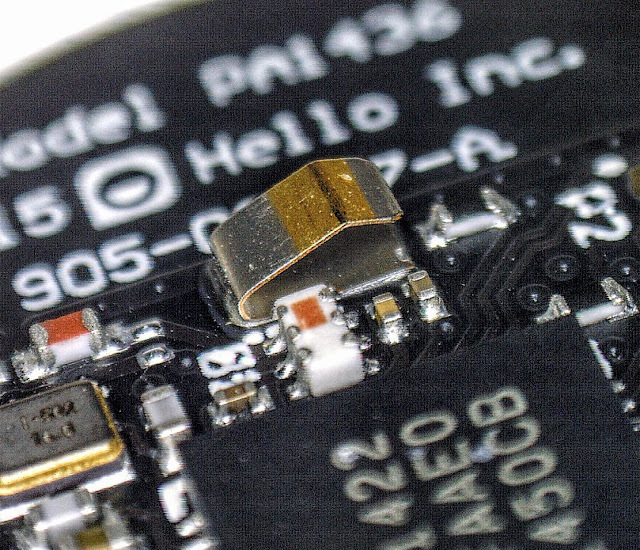 The temperature and humidity sensor are mounted on a separate PCB, at the bottom of the Sense by the micro USB power connector. 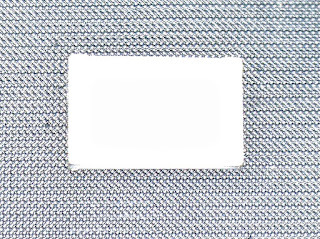 Below image shows the top of Sense with the acoustic screen removed. There are 4 ducts about 6mm deep for sensors and audio. 2 o'clock, proximity sensor, U4, using IR for hand waving detection. 4 o'clock, U2, light sensor. Below is a close up of the sensor PCB. 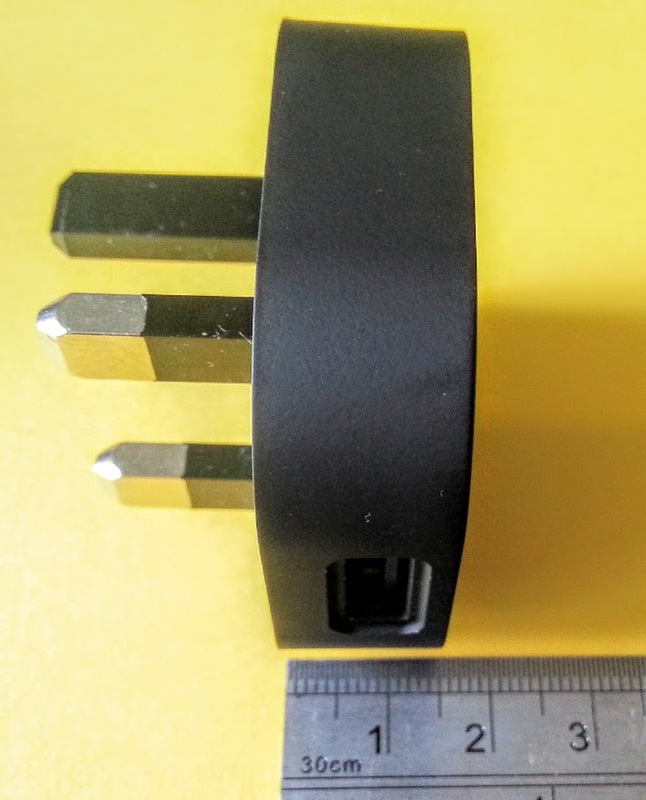 U4 - Human Proximity and ambient light sensor possibly GP2AP002A00F from Sharp, data here. This is used to detect hand waves to control the Sense. If it faced towards the user instead it could help detect if the person in bed or not. The range is only about 150mm however to detect humans, but other PIRs have much longer ranges, think of burglar alarms etc. Another alternative is a 4 pixel thermopile that could detect sitting up, lying down, multiple occupancy in the bed etc. Here is a simpler one I used a while back. Here is a 4 x 16 array used for human motion detection. 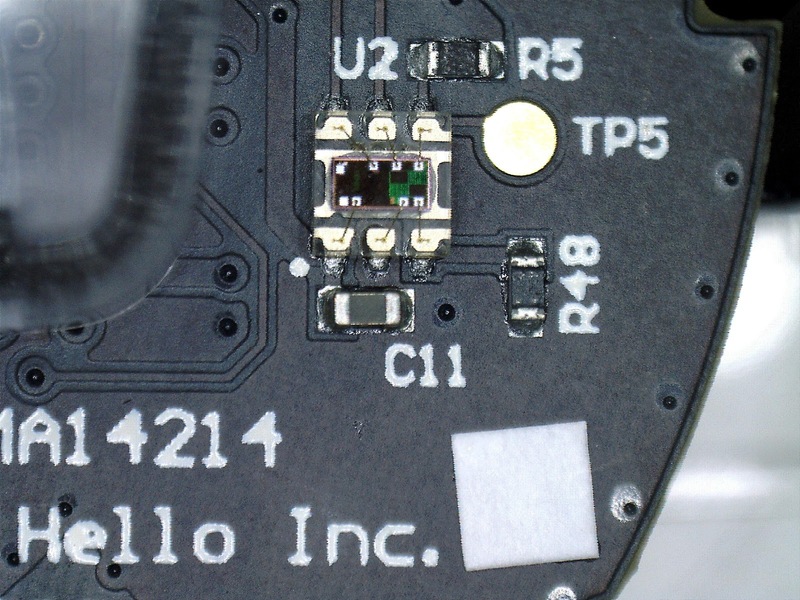 U2 light sensor - possibly TAOS ambient light/proximity sensor as here. Customers indicate that day time sleeping recording in inaccurate. 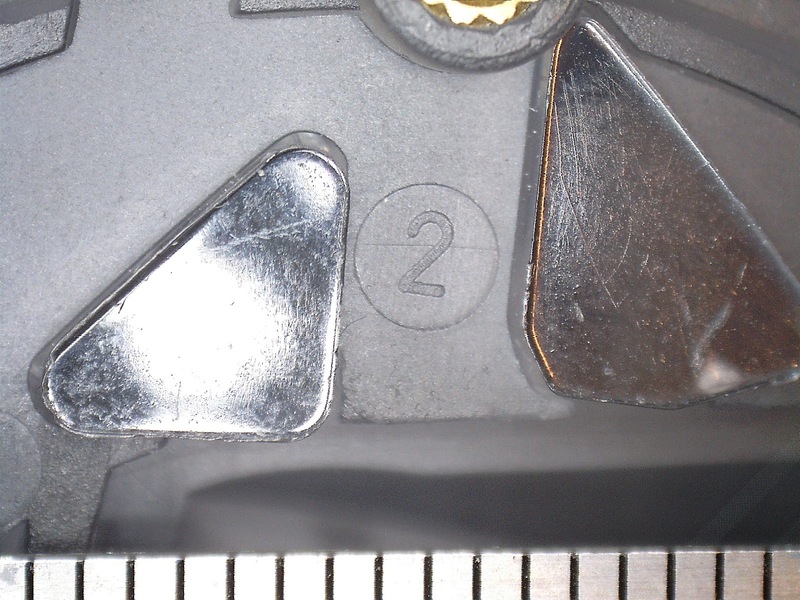 Below are the light guides inside the case, facing upwards. The left is for the light sensor and right (larger) is for infrared. Scale is show by mm ruler below. These seems to restrict the angle of view to the light sensors, the duct is around 6mm deep. so that they just face the ceiling. All the duct openings are covered by the opaque acoustic mesh. Customers have reported light brightness in lux is recorded as too dark, e.g. 0 lux. What happens when dust builds up on the Sense case? it will need to be cleaned else light intensity reduced. Below are the light guides from the top of the Sense sphere, with acoustic mesh in place. I had removed the black opaque acoustic mesh and could check how much it reduced the light to the sensor, as well as the 6mm deep duct restriction. 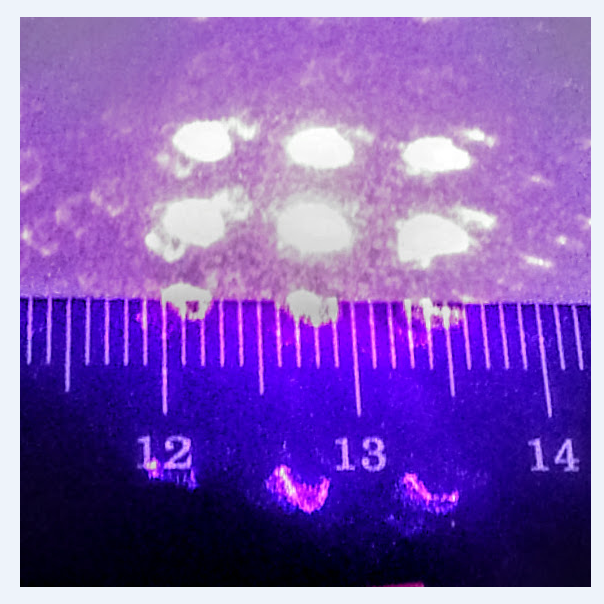 Image below left is with a coin covering Samsung Galaxy S3 light sensor, (0 Lux) middle image is with acoustic mesh (5 lux) and right image is no light restriction on sensor (27 Lux). Light source was overcast evening light, UK about 2000 BST. I am not sure why acoustic mesh placed over light sensor, the Sense is probably calibrated to allow for this, but reduces the resolution for low light measurement. I have looked into the acoustic mesh a bit more. I use a UV laser to project the mesh to a white wall as below. 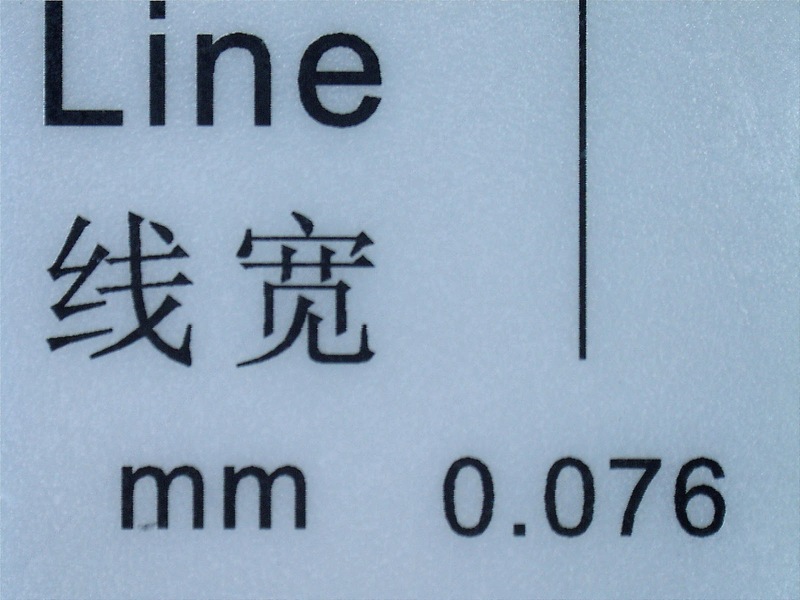 The mesh to wall distance, 868mm, aperture size on wall approx 3mm. (Ruler shows 1mm graduations) This calculates to a mesh aperture size of approx 3.4 microns. My measurements are experimental so need to check again. If aperture size is 3 microns, then particles over that size will be blocked from entering the sphere if the mesh in place. The was to be used to detect snoring as per the Kickstarter promotion. The microphone should have a low frequency response (starting at 10Hz) and a high sensitivity to record snoring as mic could be around 1 metre from sleeper. 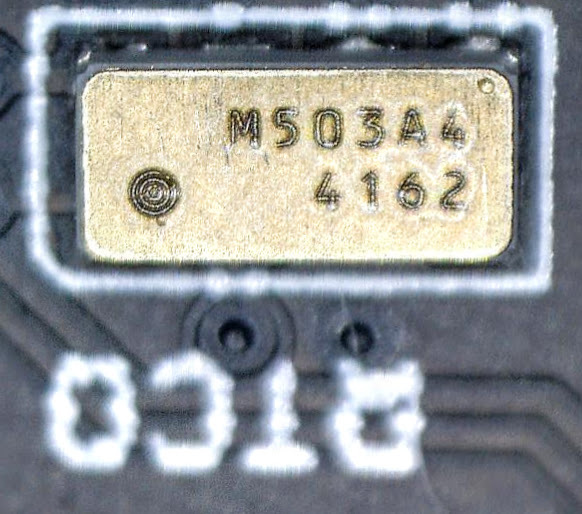 Most MEMs microphones have a frequency response that starts at 100Hz, ends at 10KHz, as designed for speech recording. The mono microphone probably has an analogue output to interface to the Codec. Ideally the microphone would record in stereo to allow directional information to determine noise, e,g, partners or pets. Hello have not provided sleep audio or snoring recording on the current Sense as promised, but it is coming "soon" according to Hello Inc (23/7/2015 TelCon). However the accelerometer (in the Pill and closer to person) can measure much lower frequencies, (Below 1Hz) is this a future option for low frequency snoring and breath recording? 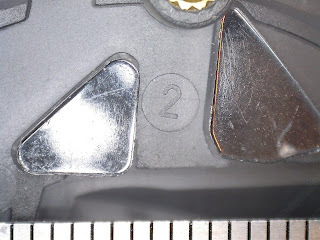 Below, on top of the microphone is a cone like duct embedded in the plastic case. 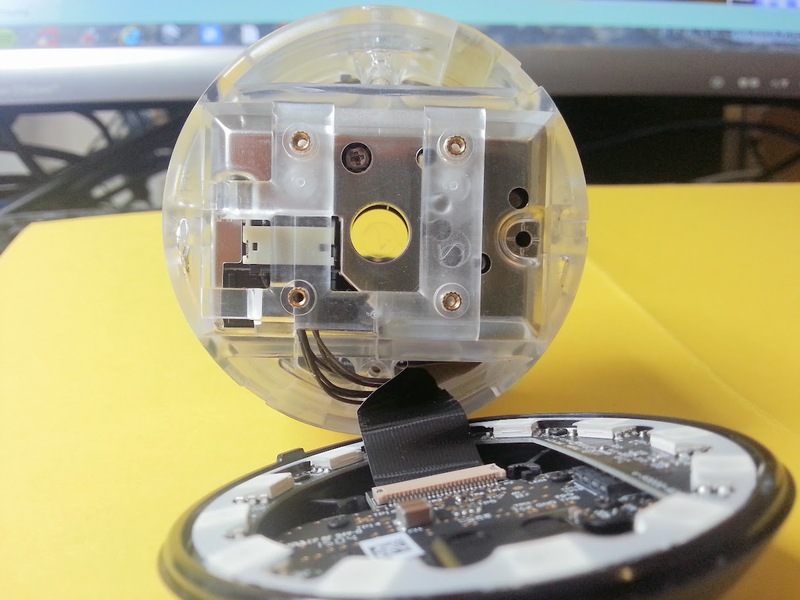 The small round hole corresponds to the microphone input, diameter approx 1mm, and the plastic duct to the top of the Sense sphere is approx 6mm high. 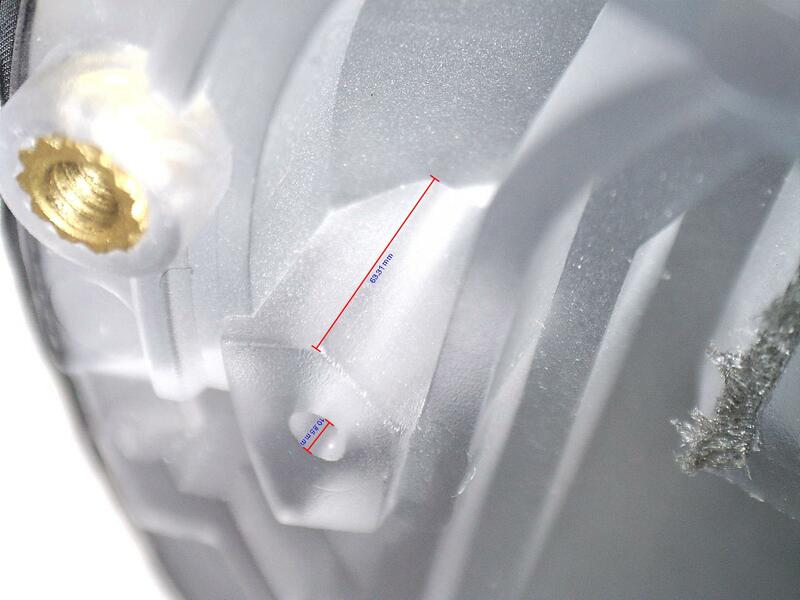 The 1mm hole widens into a cone opening to allow a microphone audio entry hole on top of sphere (acoustic mesh removed), approx 6mm in diameter, as below. If the microphone is omnidirectional, which it should be to pick up snoring sounds, vehicles etc, is not the signal attenuated by this conical construction? 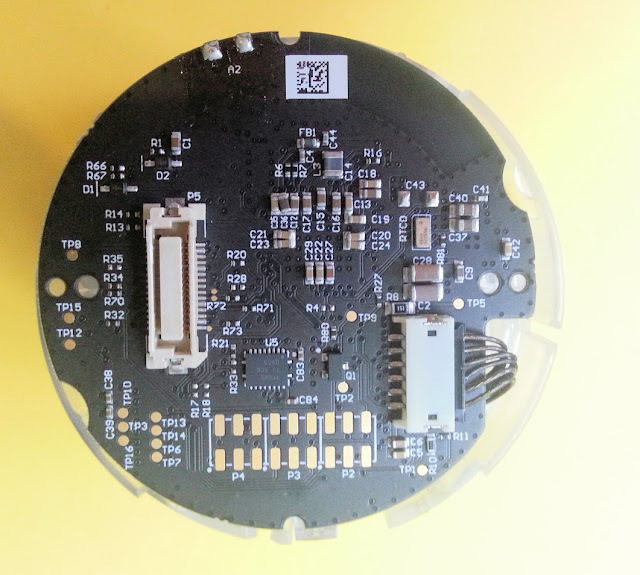 In the centre of the PCB, is an offset loudspeaker. The reason for the deviation is unknown. It is magnetic so was it moved as caused interference to the microphone? The top cover for the loudspeaker is glued onto the case. 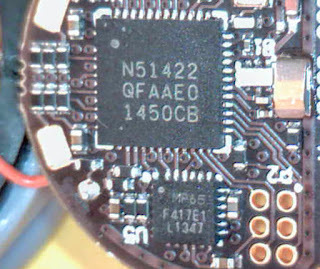 Below image shows the bottom of the sensor pcb, the 2 x 15 way multi-way connector is used to connect to the main MPU board. There is a Nordic N51422 ANT/Bluetooth System on Chip, ARM Cortex M0, (same as used in the Pill - see below) , more data here. It is clocked at 16MHz. 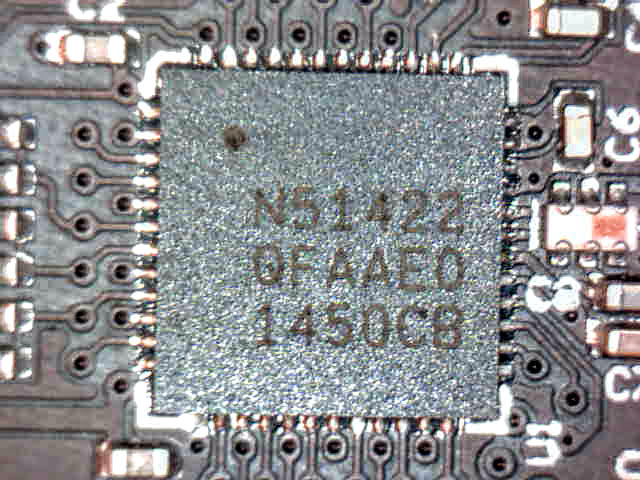 There is a 24 pin Nuvoton NAU8814Y U3, image below. This is a Mono Audio Codec, data here additional datasheet here. It provides a 24 bit input, 48KHz sample rate from an analog input e.g. the microphone. Automatic Gain Control (AGC) is provided. There is also a 1W amplifier for the external speaker. I have made an assumption that an analogue microphone (M1) and analogue op amp (U11) are used for audio in. Below is mic and analogue amplifier circuit. There is a DC power supply of 5V on this board but I can't see any output from microphone on the oscilloscope, e.g. from my test sine wave audio amplifier. I will investigate more. It seems R31, R45, R47 are omitted. Below data on Nordic 51422, click to enlarge. Below image shows the BOB (Break out Board?) signals, P4, P5, P6, including serial clock, receive and other signals, from the FCC image. This BOB legend removed for customer products but test pads still available. 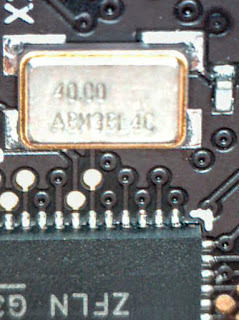 Below image, top of main PCB. 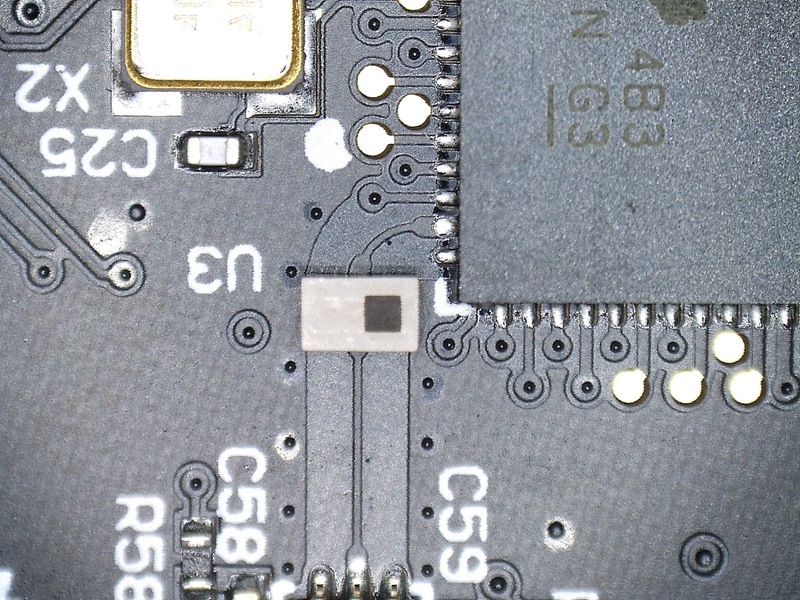 The connector P5 connects to the sensor board. The 6 discrete cables on the right hand side connect to the Air Quality sensor. This is the Real Time Clock, with internal 32.768KHz. Made by Micro Crystal 4162, data here. I can't see any battery backup in case Sense unplugged. Texas Instruments YF08E. 8-Bit Bidirectional Voltage-Level Translator? Useful for debugging? Below image shows bottom of Main PCB . 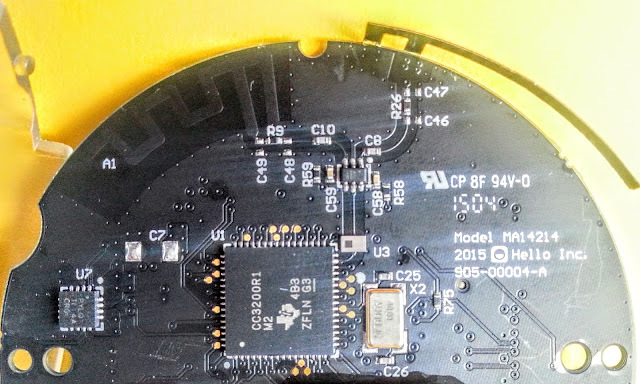 The module under R3 is for the FLASH memory. 8GB was used in the prototype and production versions so sufficient for many hours of audio recording. The ribbon cable connector to the LED PCB and power supply. 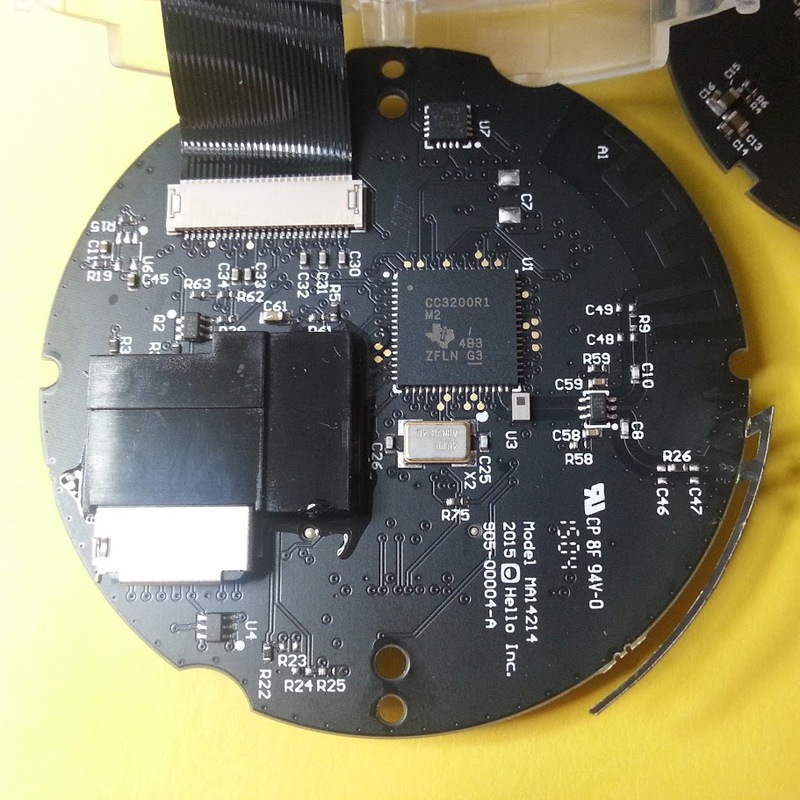 The Texas CC3200 is a single chip Wireless ARM Cortex M4 MCU more data here. 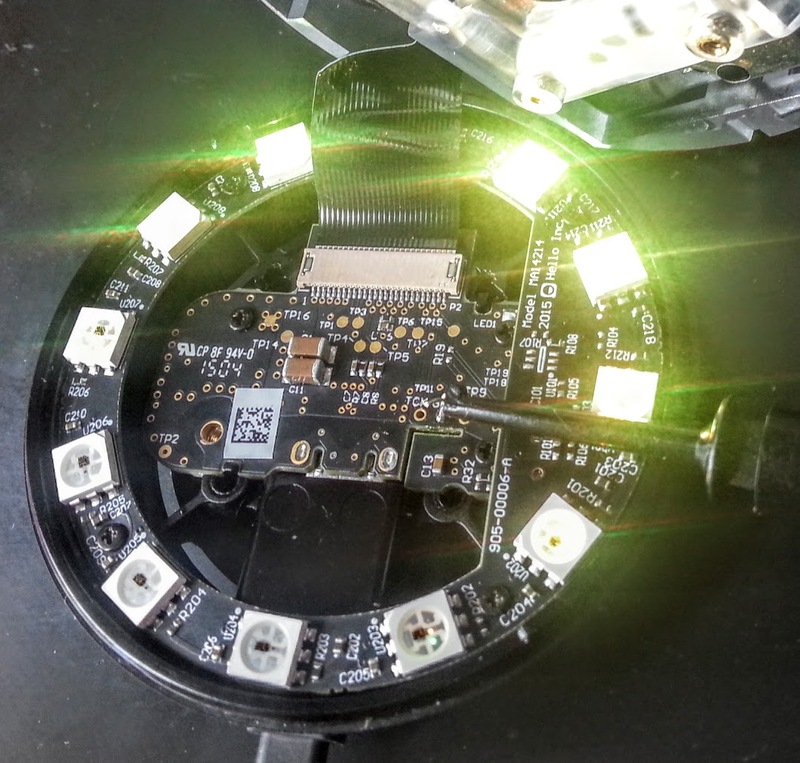 The ribbon cable connects to the 12 LEDs, Humidity sensor, test pins and power supply PCB. Application notes and schematics here. Here is the Texas devkit used by Hello. 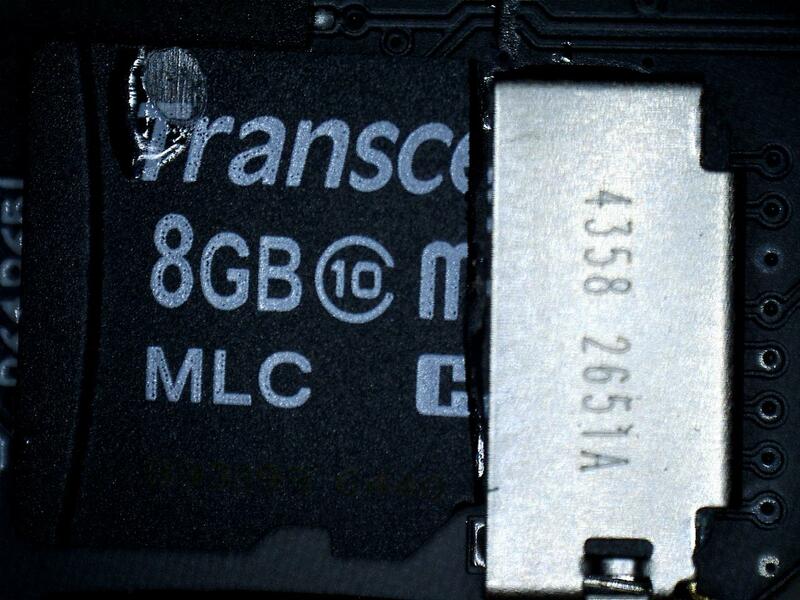 Below Transcend 8GB memory, black cover removed. Also under the black cover and next to CC3200 MPU is an MX25U12835 serial Flash memory, 16Mbytes, data as here. 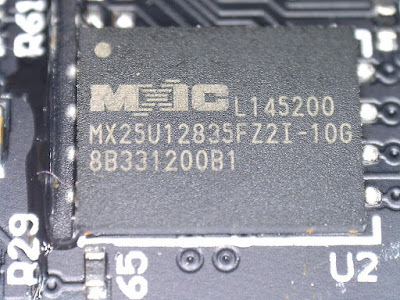 This may be used to keep the original factory firmware. 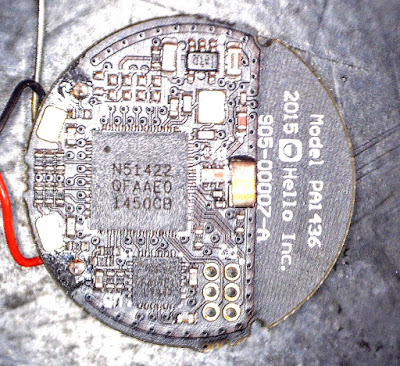 Below shows close up of Bluetooth antenna (A1) on left, and the Wifi antenna on the right. 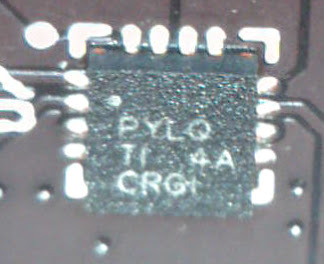 40MHz crystal clock oscillator for ARM MPU. PYLO TI (Texas Instruments?) semiconductor, unknown function. 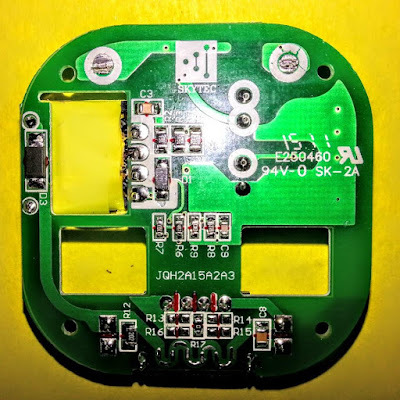 RF Filter?, data here U3 connected to CC3200 MPU. Wifi antenna below. Yes it is designed to be curved and be physically unsupported. Is this strong enough? 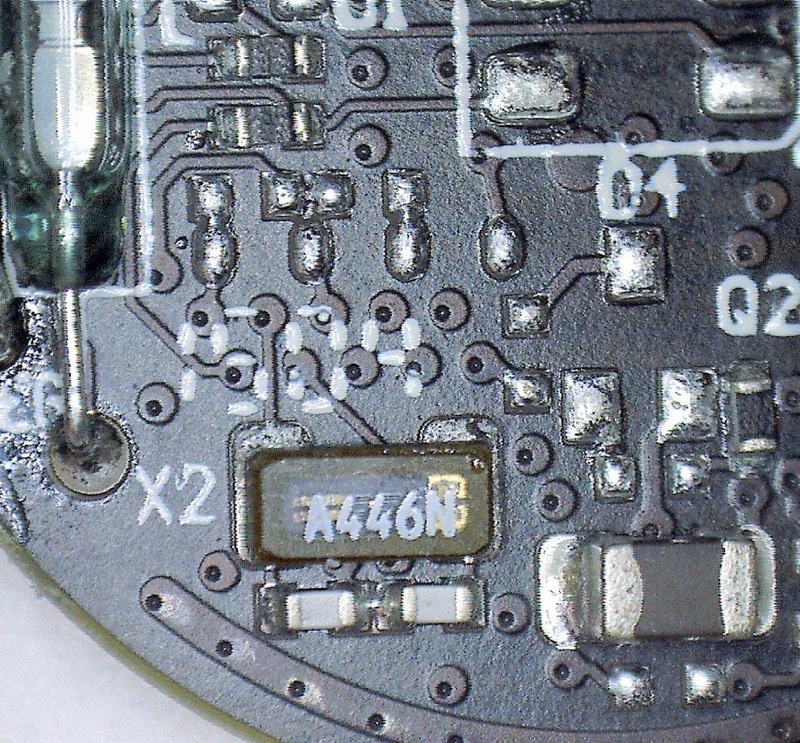 I noticed today that part of the wifi antenna was detached , unsure if this is a soldering dry joint re crystalline image or user error, e.g. my handing of unit. Correct soldering joints are smooth and shiny, dry joints are dull and crystalline. See below. 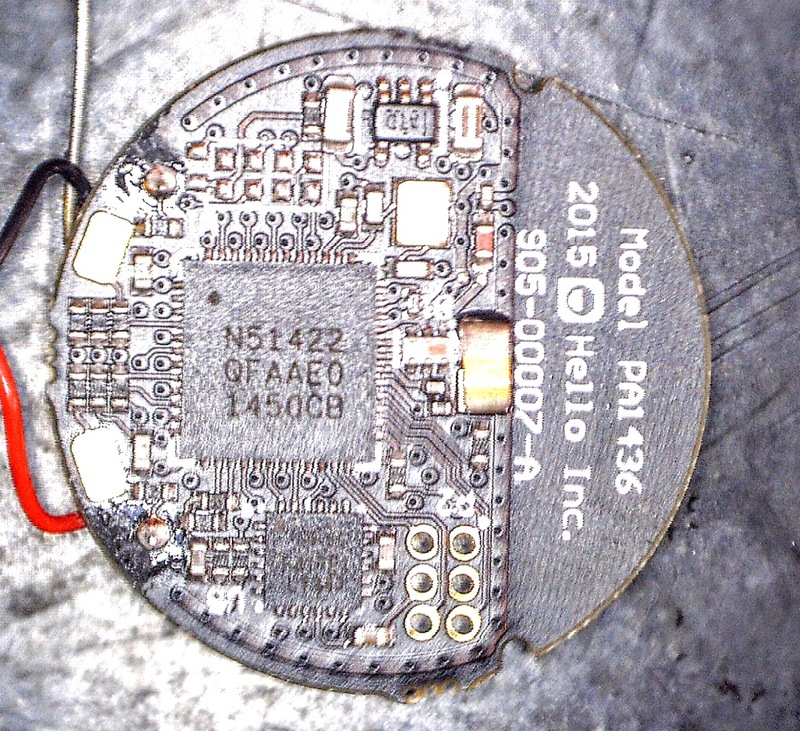 The wifi antenna seemed to have been hand soldered. Many customers have complained of intermittent wifi. How strong is the wifi antenna re mechanical stress? Update 22/7/2015, Hello Inc have confirmed by email there is no Pollen counter in the Sense. (Tobacco sensing is part of the Sharp sensor features already, I did not request it, and I don't smoke). 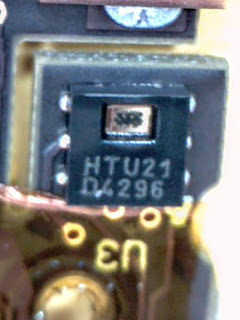 The Sense uses a component from the Sharp GP2Y10 Dust Sensor family as here. 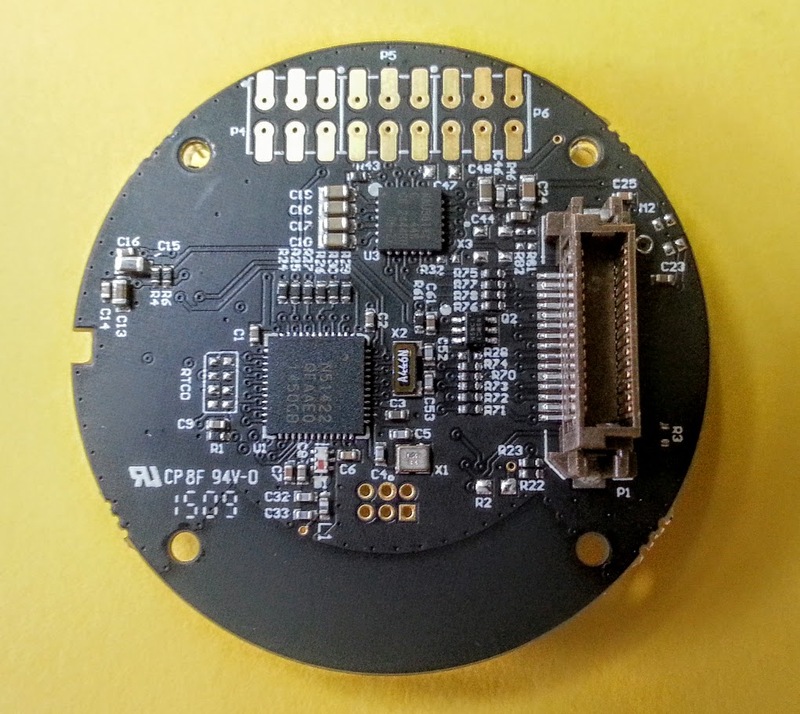 This is the largest sensor in the Sense, size 46 mm x 30mm x 18mm and takes up a major part of the volume of the sphere. 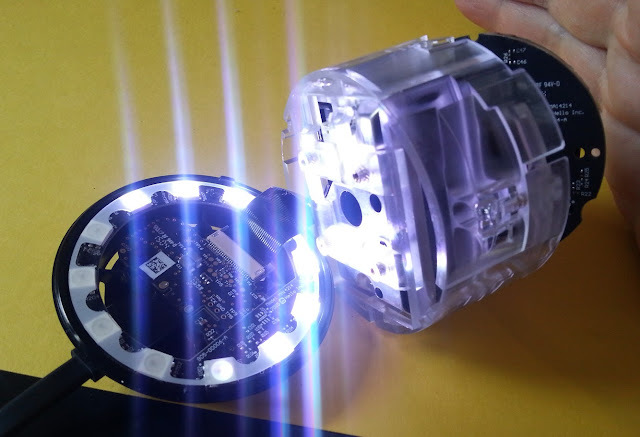 LED optical sensing is used to measure house dust, smoke (tobacco) after about 5 minutes of sampling and filtering a potentially noisy signal. 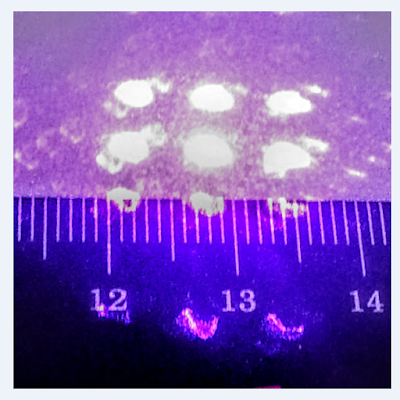 Normally for counting pollen a laser light is used e.g. UV, this causes bio florescence of organic particles, e.g. pollen, and differentiates between these and inorganic particles. Checking the Sharp data sheet, the sensor can detect particles from 0 to 300 micrograms per metre cubed. It does not mention in the specification, particulate size or pollen count. There is an air outlet/inlet on the bottom of the Sense, but can be blocked if placed on a soft surface. There is also an acoustic mesh to block dust fitted around around the Sense. How does Sense distinguish between dust and pollen? The dust signal output is a PWM/analogue to the ARM MPU. There seem to be some queries from users as to if the Air Quality measurement (inc pollen count) is used in the current version of Sense. There is no mechanism for sizing of particles in the Sharp device. The sensor is also mounted at a 90 degrees angle difference from manufacturer's datasheet, this means air tunnel is vertical not horizontal. Does this matter? 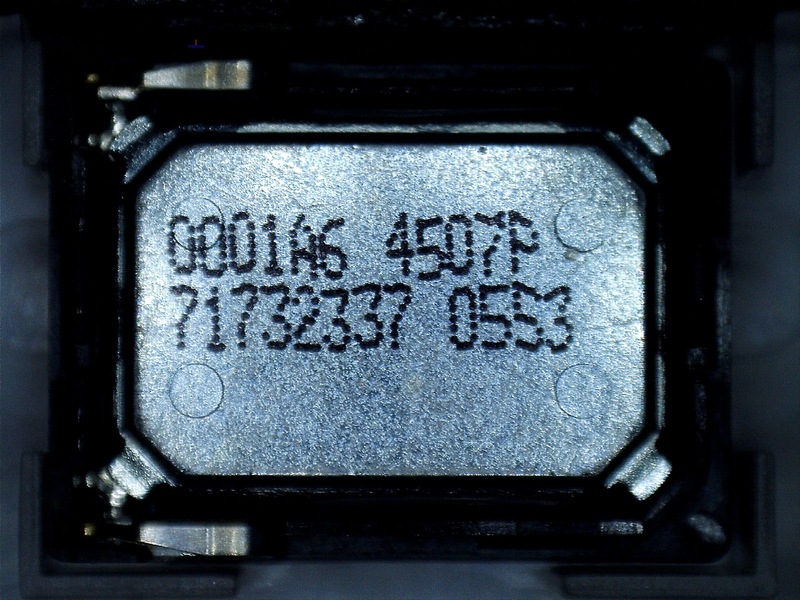 Customers can quickly check with smoke, e.g, tobacco to see if any response from the sensor. However here in an interesting research paper on using dust sensors to measure particulate matter, it describes the use of the above Sharp sensor but does not mention pollen. Future designs of AQ sensing can use the Figaro TGS8100. 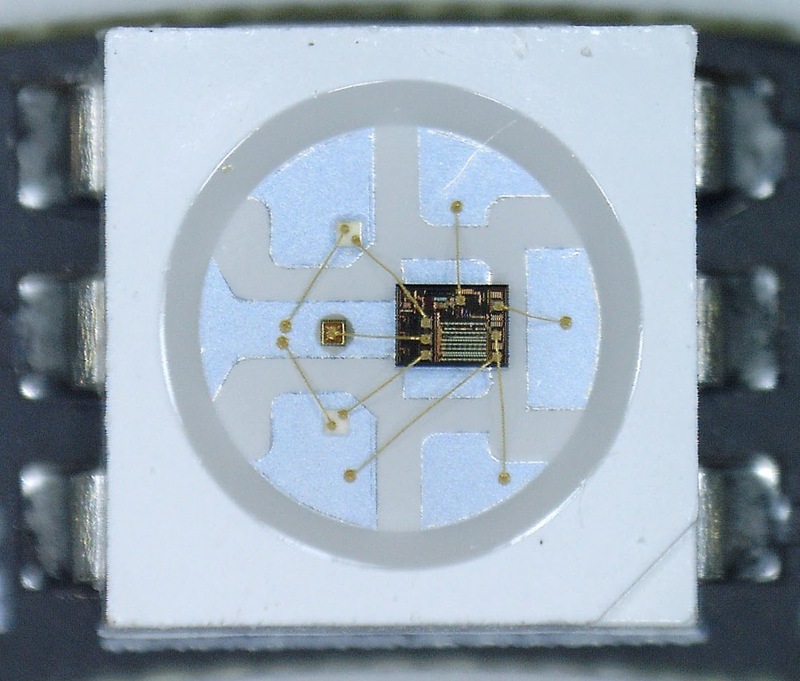 This tiny MEMS device measures indoor AQ such as tobacco, cooking smells, excludes Pollen, but size just 3mm x 3mm. Mobile phones may have AQ built in, in future. Below, image from FCC, upper left, Sharp sensor, upper right enclosure for sensor, bottom left, sensor pcb, bottom right air venting cover. Below is the Air Quality Sensor, top view of PCB. 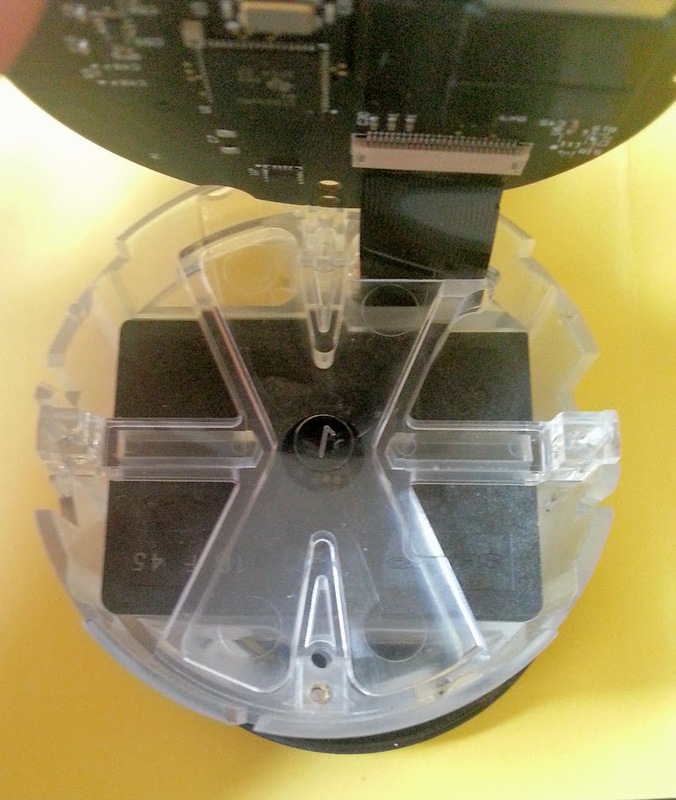 The 6 sided construction seems to be part of the airflow for the dust sensor. The detail in the mechanical CAD design is beautiful and very high quality. Below, large green rectangle, shows the Sharp dust sensor. The red outline is the air vent for particles. The air guide in the Sharp sensor is vertical. 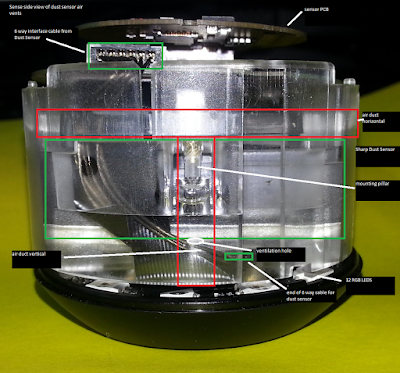 Below, shows Sharp guide to mounting of dust sensor note, note horizontal air guide, it is not clear from the data sheet how important orientation is. Shown below attached to USB power supply board. LED display and power supply pcb. 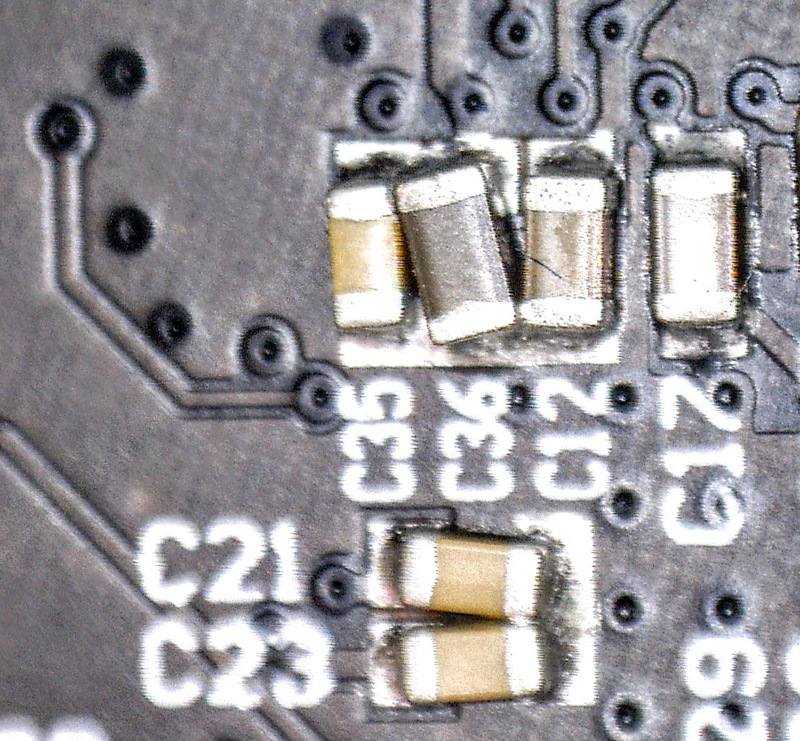 The 12 LEDs are RGB, possibly WS2812, data here. These LEDs are serially addressable to provide a mix of Red, Green and Blue. The multi-way ribbon connector connects power and LED control signals to the main PCB. The cable also connects the humidity and temperature sensor to main PCB. I do not know why so many wires are required in the ribbon cable, but it could be for pads for the automatic test equipment to read logic signals from the rest of the PCBS. 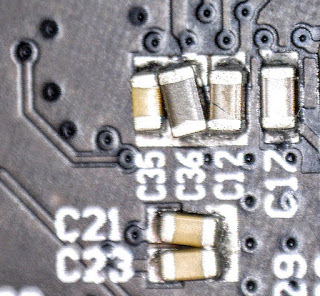 There are approx 16 test pins on this pcb. 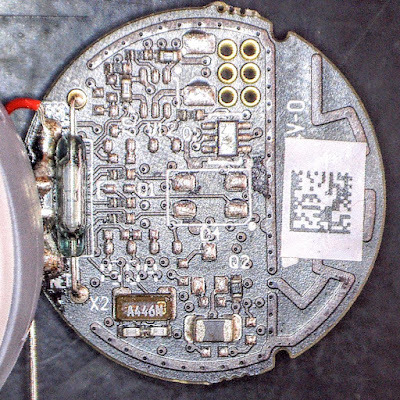 This is one of the challenges of building inaccessible PCBs inside a sphere. Also the cable is twisted and folded, why is the fold required and not a neat vertical alignment of cable? I am still waiting to hear from Hello support re Bluetooth pairing so the Sense is not fully operating, just some spinning LEDS. I really want to look at the Air Quality signals, but only DC levels, no microcontroller clocks as I think software is still waiting to initialise for sensing. Below shows serial data for the spinning LEDs, 5V signal. Debug probe attached for scope. 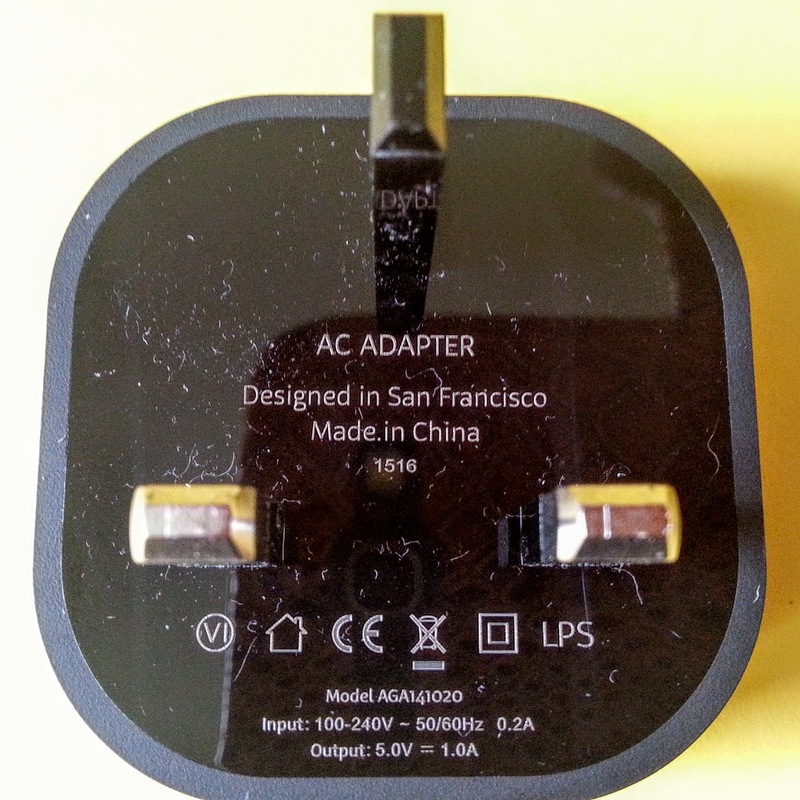 This receives power from the USB connector and provides voltage regulation. 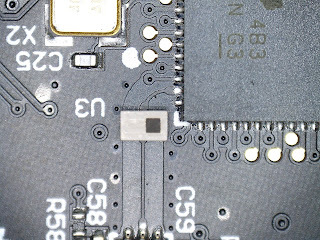 The below 6 pin semiconductor seen next to to USB power in. It is a Measurement Specialities HTU2D MEMS humidity and temperature sensor, data as here. 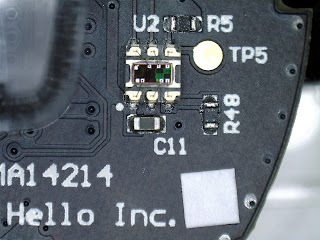 It is mounted at the bottom of the Sense about 4 mm from the USB power in. The humidity digital output of up to 12-14 bits is in I2C format. Customers have reported possibly inaccurate temperature sensing in the Sense, i.e. of up to 5C above ambient. Is this due to the position of the sensor and restricted air flow? 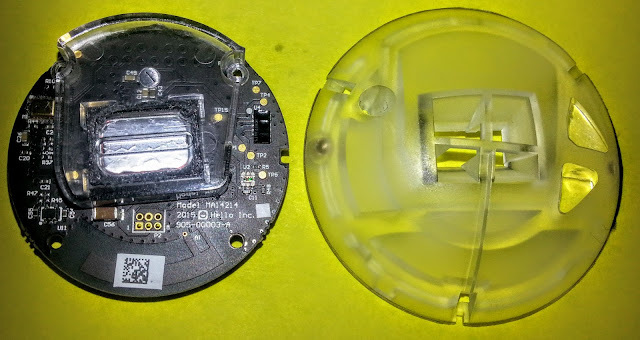 There is the specified milled insulation slot as described below, but is the temperature sensor measuring the temp inside the sphere or actual room temp? 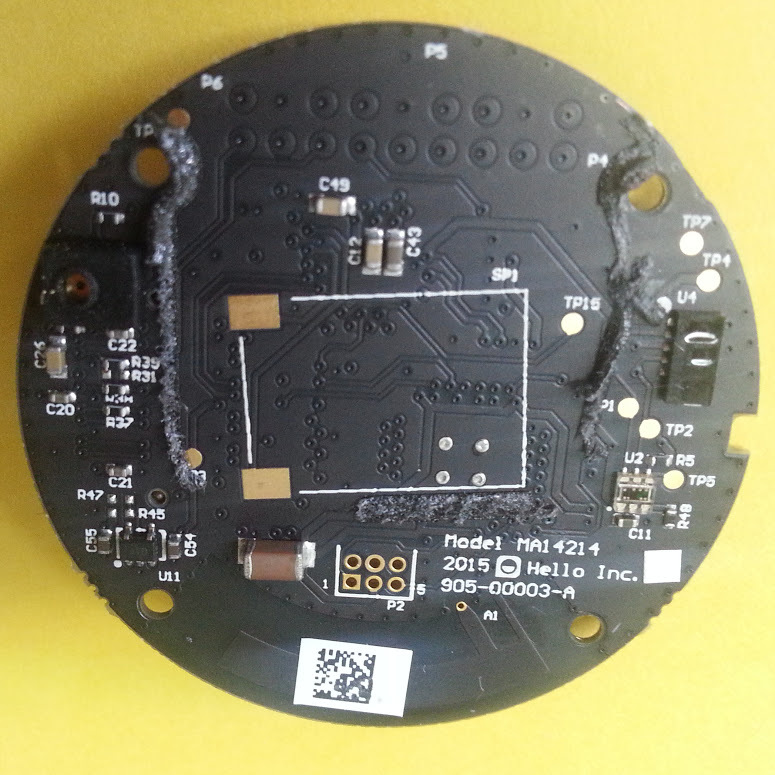 CR2025 Lithium coin non rechargeable battery, 3V, 170 mAHr capacity, typical design here. This Pill hangs off the user's pillow in the bed to record motion sensing and transmits via Bluetooth to the Sense. There is no proof that this is the best way to measure human movement in a bed. The normal sleep detector Apps for mobile phone allow the accelerometer in the phone to lie on the bed, allowing bettering mechanical filtering of user movement. 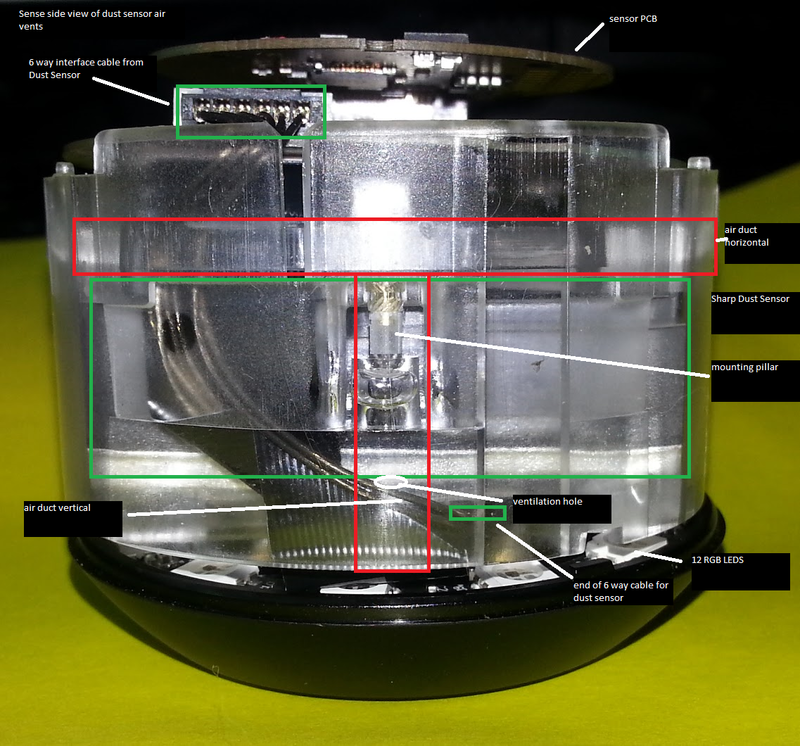 Image below shows Inversense MP65 accelerometer and gyro. The semiconductor is 3mm x 3mm. There are 6 sensing axis, more data here on the family. The accelerometer can measure up to +/- 16g. Also temperature sensor is included. Is this temperature measurement used by the Sense to determine is person in bed? I am using an oscilloscope to try to view an interrupt or I2C message sent out of MP65 accelerometer when tapped but nothing seen yet apart from 3V power supply. Therefore I am looking looking at the power consumption from the coin cell to check pill activity. 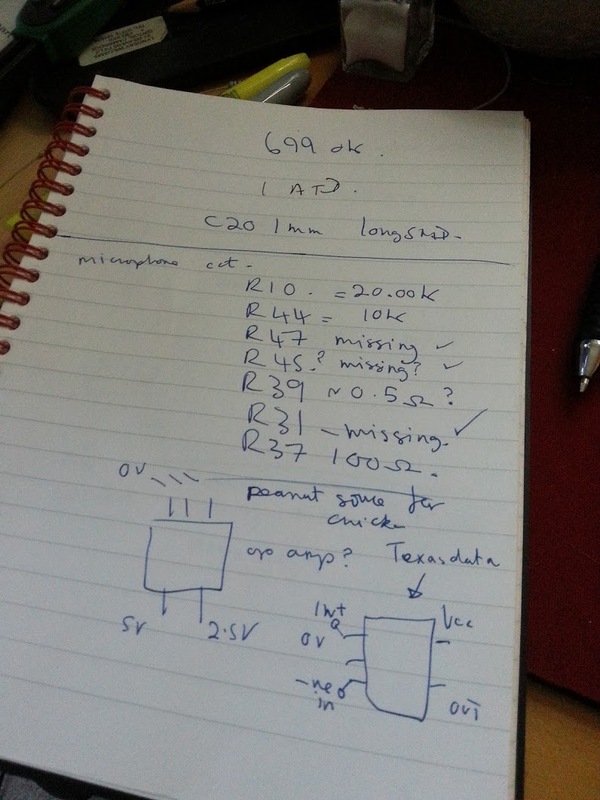 I have a measured 5.0 Ω resistor (marked 4.7 ohm) in series with coin cell power supply to measure the current. Every 1000ms there is a voltage drop, of approx 35mV, which calculates to approx 7mA which is possibly Bluetooth being transmitted. The CR2025 max peak current is 15mA. Each pulse lasts about 1mS, so a duty cycle of around 0.1% for Bluetooth transmit in the Pill. It seems the Pill is transmitting Bluetooth every second, even when no movement detected. The battery would last longer if no transmit when no movement detected. Perhaps Pill is stuck in pairing mode? There is another logic process occurring approx every 500ms, possibly the MPU. Below image, I now am triggering the accelerometer by stroking it. Below shows the quiescent current seems to be about 0.1mA. The CR2025 battery has a capacity of approx 170mAh which calculates to an estimated battery life of about 70 days. This is with minimal Bluetooth activity. There is a lot of noise in the signal and I may have my measurements wrong. However many customers had Pills delivered with non working battery. 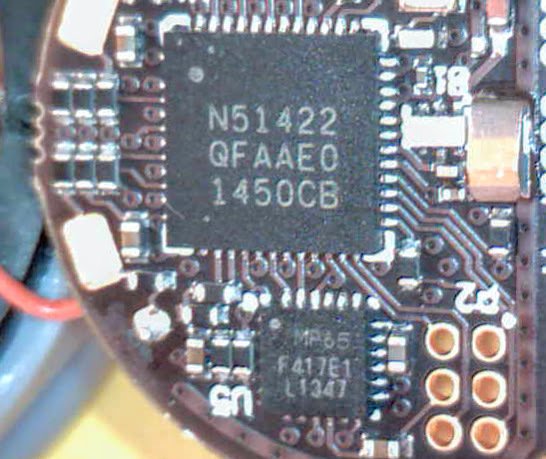 Below Bluetooth debugging circuit, from top, SMD clip probe, resistor 4.7 ohm, oscilloscope earth. 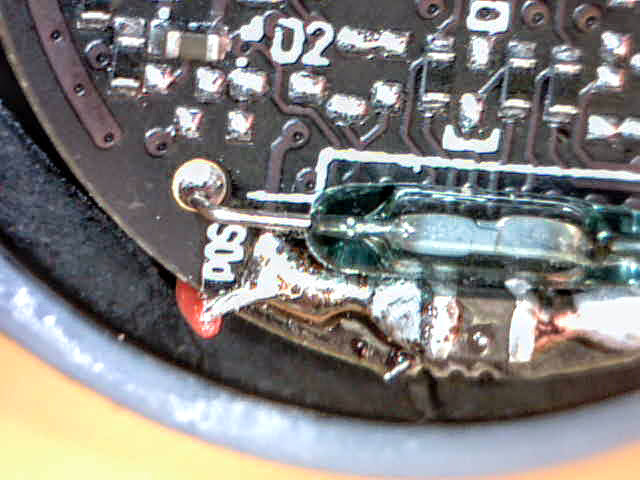 Resistor inserted in a break in +V terminal of battery. Below looks like the magnetic reed relay switch used to keep the Pill switched off during shipping and so saving battery. 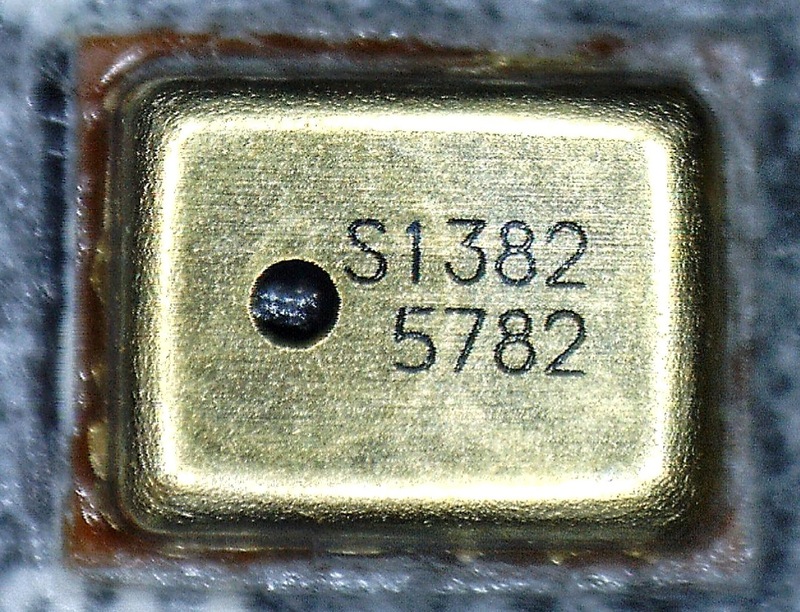 Below is a spring connector in the Pill, part of the coin cell circuit. Size approx 2mm long. Is the Pill waterproof even though a replaceable battery? This is the smallest 5W output USB power supply in the UK I have seen! There have been 8 UK customers on Kickstarter and Twitter that have reported overheating, smell, smoke etc. I informed Hello in June but no response. I haven't taken it apart yet. The Sense worked (i.e. LEDs flashed) for a few days on the supplied power supply but then failed, i.e. no LEDs at all came on. 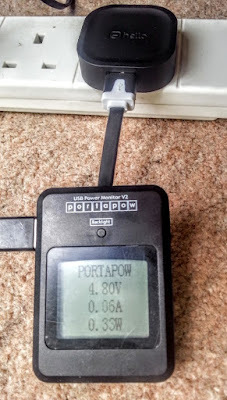 The voltage from the Hello USB power supply was just 4.75V to 4.8V. I also measured the voltage from the Hello power supply off load, i.e. no Sense connected, and voltage was still 4.80V. 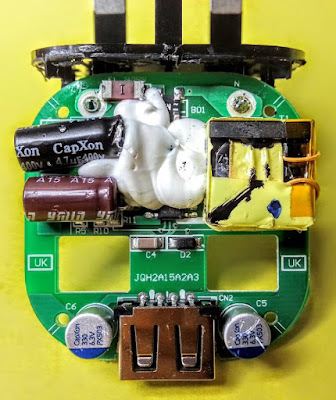 I am wondering if the polyfuse operated due to a surge but is now high resistance and now dropping the voltage by about 0.20V and this is insufficient for the Sense to work. 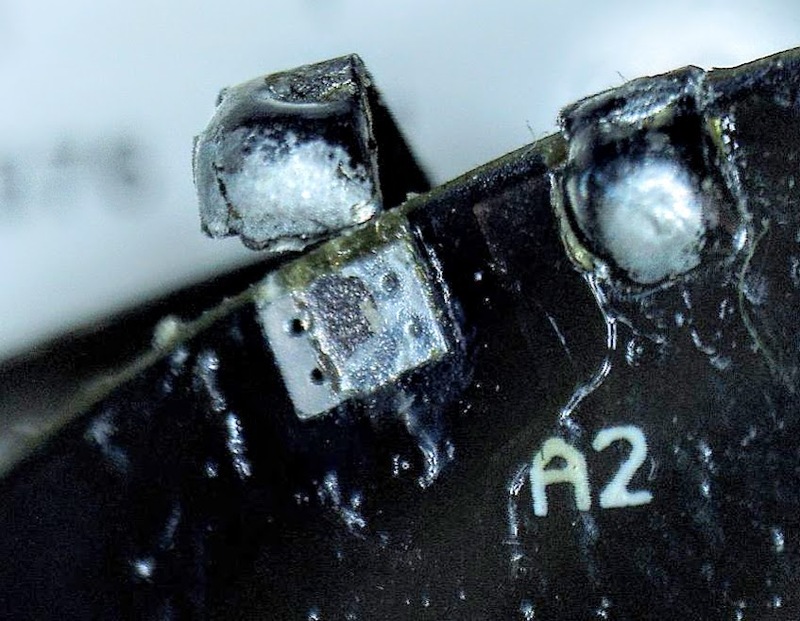 I understand that polyfuses recover in a few days, if this is indeed the reason for the low 4.8V. Update 13/7/2015, The Sense now works 2 days later with a recovered polyfuse inside the supplied Hello USB power supply. This suggests the polyfuse has reset. Sense now spins purple waiting to pair with iPad Air. 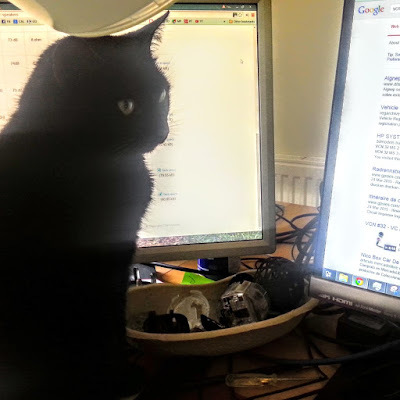 The Sense does not pair at the moment, but Hello Support are assisting. Hello power supply off load. I tried an Apple iPad power supply as below, 5.14V output and the Sense boots up partially , i.e. to spinning green/yellow LEDs. Still trying to get Bluetooth connection. Below power supply noise from Hello USB power supply (does not power Sense). Note 1V peaks. Measured with no load. These spikes are very high compared to the Apple iPad. Would these cause noise problems on the audio circuit? This USB power supply is not a battery charger, it is directly for electronic circuits to work on. Below quieter power supply noise from Apple iPad power supply (does power Sense). Measured with no load. Update 16 August, teardown of UK 100- 240V USB power supply. 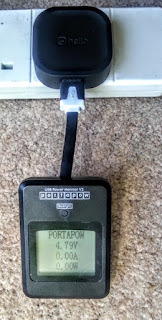 Inside the UK (100V - 240V) Sense USB switched mode power supply. It is rated at 5V output 1A. 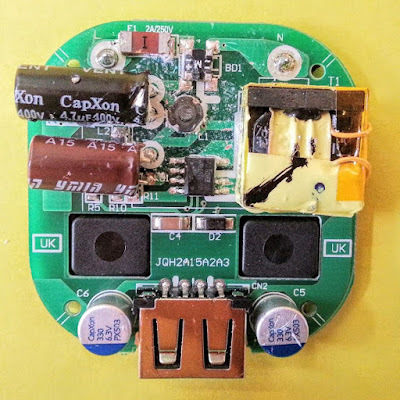 This is the smallest 5W power supply I have ever seen on the web. The outside case was moulded, and some of the inside circuit potted, you can see white residue where I removed it. 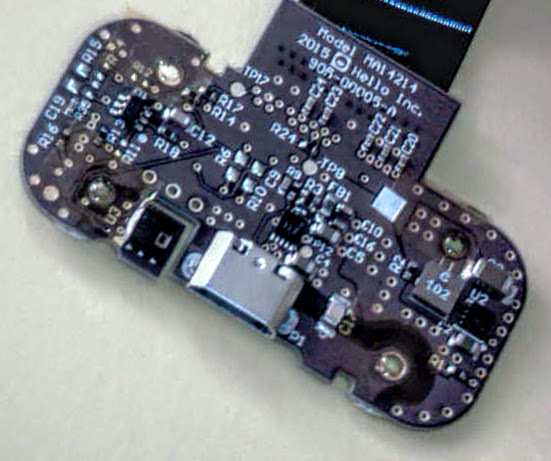 It seems the main Live pin (L) connects to Fuse F1, (resettable Polyfuse?) then Bridge Rectifier? (BD1 ) the neutral (N) connects to other side of Bridge Rectifier. The yellow component is an EPC13 transformer. At least 8 UK customers have reported burning or smell issues. Why do customers have so many problems with Bluetooth pairing? Why do many customers reports sensors don't work e.g. Pill, can't detect sleep, Air Quality, Pollen, light sensor, mic-snoring,? Is a motion sensor clipped to a pillow accurate enough to detect human movement/presence? Is the temperature sensor in the Pill's accelerometer used for human detection? Can Hello Inc or other companies redesign and simplify the hardware for half the cost ? 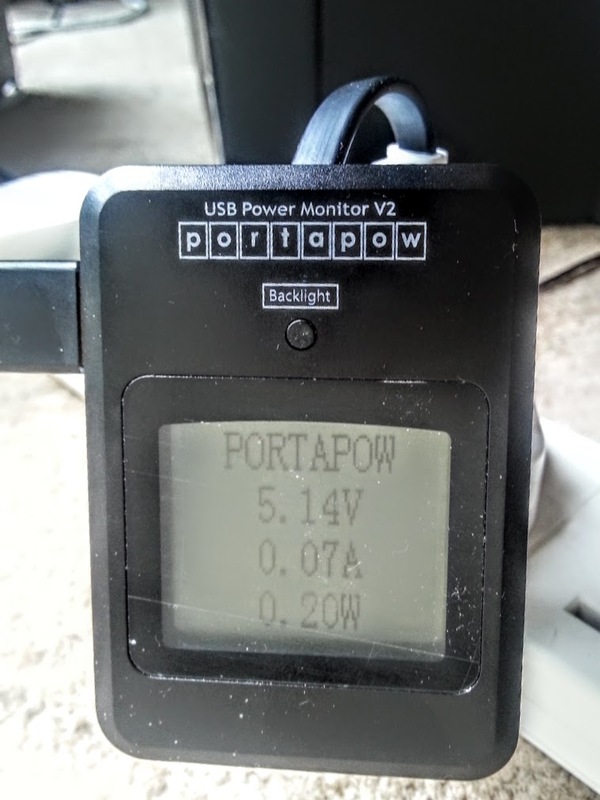 Why did at least 8 UK customers, with UK 240V USB power supplies have overheating and smoke problems as reported on Twitter and Kickstarter? Why does audio recording at night, re snores etc, not work- the hardware and bandwidth exist? Why no white noise audio playback as advertised? How is Sense better than the sensor platforms of smartphones that just need a $1 app and give better performance re sleep Apps? I note the old fashioned but simple way to see if someone is asleep is to ask them, "Hello are you asleep?" If "no" answer then awake. If awake but ignoring might turn over ( accelerometer can detect this) Perhaps Sense can ask the user questions and analyse the reply, and also review the sleep detection algorithm. It is appreciated that a heart rate monitor can be uncomfortable to wear every night. The Sense is in about 40 pieces (in the surgeon's kidney bowl) but still functions, but we will continue dissection and analysis later. Additional Information. Hello Sense Patents here. Microscope calibration line is 76 microns wide. Any errors, omissions etc, in this blog, contact Lyndsay Williams, Cambridge, UK sensecam@gmail.com or +44 (0) 7979 101578. Thank you to Leon for loan of Sense. This, is the most fantastic teardown I have ever read. Thank you for sharing your work! Dear Anon, thank you for your comment. Great work Lyndsay! Even though people are displeased with a few aspects of Sense I feel like they did a great job overall engineering the unit and just need to iron out a couple flaws. In order to make discussions about Sense centralized, I set up a forum at senseforum.com . I can't post in the Kickstarter comments so this is the only way I could reach out. Regards. This is an excellent tear-down, one I'd hoped not to have to do on my own unit :), thank you very much. It's a very expensive build, far more than I was expecting - I imagine they'd be investing in substantial cost reduction engineering right about now :). I don't suppose you produced a major-items-BoM during all of this? I'd be fascinated to estimate what their mfg cost is. I'd assumed the particulate sensor would be the least engineered part of the product, so am surprised by what they ended up going with; albeit disappointed it doesn't do pollen count, which is of far more interest to me & my sinuses. I'm also finding rather gaping discrepancies between my & partner's "you moved around a lot" and "you both moved around a lot" reports each morning - suspecting the coupling to the pillow is sub-optimal compared to a wrist strap arrangement (a la fitbit et. al.). The persistent absence of audio telemetry features is unfortunate. It's not like they have any lack of funding to develop said/promised features, now 6+ months after delivering the Kickstarter crowd, more likely they're having trouble getting it to be meaningful. I wonder why. But I have to challenge you on the suggestion that the old fashioned way to see if someone's asleep is to just ask them - did you write this on 1st April? :p The last thing I'd want when *trying to get to sleep* is to have a voice beside my bed asking me every 5 minutes "*knock knock knock* Anthony, are you awake?" and have to answer it! I think this is where the next level of bio-connectedness has to come to the consumer level, measuring brainwaves or some such near-direct measurement, this pillow/arm-movement malarkey just doesn't seem to cut it. Are you sure that's an "acoustic mesh" all around the PCBs? What for? I'd have thought it was more likely to be RFI filtering mesh for EMC compliance purposes. Thanks again, I agree this is one of the most thorough tear-downs of a device like this I've ever seen. Hi Techydude, my apologies for very late reply. looked at the project for a while so not sure if the added the missing features. Yes, detection of sleep onset can best be done by EEG and that is not measured by Sense. Thank you. I am glad you found it useful. Interesting to find this in-depth article. I am an end user, new and looking for an answer. I had both pills working for a week then one stopped recording that is it stopped responding to the Sense, no LEDs. I now can't pair the Sense in the app, only in my Nexus 6 Bluetooth manually outside if the app and it recorded data last night. Having two pills has been confusing to set up. I set it up firstly as two names with one email. But that seems to be an issue now. So set up two accounts two email. Only one phone pairs the Nexus 5. I don't have the knowledge to understand the whys of things now not working. Your comment about battery life may apply. Even though all says pill battery is good, I got no response from shaking it until I replaced the battery (1 week old). My husband tested the battery voltage and is still 2.56 voltage but was that sufficient to run the pill, I don't know. I want this to work but after spending 3/4 hours trying all I could think of abd not hearing back from Hello I am disappointed this is so hard to sort out. Very kind of you to respond. No I have written several emails over the past few days. I hoped that the company had immediate support but now I realize that was expecting too much. No matter, after several hours and 4 /5 issues I got it all up and running. I believe that this product can be great but it needs time to sort out glitches and it needs quick turnaround when issues arise. I know not everyone is like me and willing to spending hours sorting out issues. No sense having a product that makes customers lose sleep :>). I did have a look at the FB page (thanks for the link). Thanks for your article and your response. You should be getting some compensation from Hello for all your work. Lyndsay, wow, fantastic teardown and report. Very nice work. My question, if you have a moment is this... I am a bit of a hardware and software hacker and am wondering if my Sense can be tapped into and used as a room monitor now that Hello is closing down? In other words, with the mother ship cloud gone, how can I use the hardware? I don't need sleep tracking (I use my Fitbit Blaze for that), so the pill is not required, but the sphere has some nice hardware sensors, I would love to get their data out and into my home automation system. I have no connection to Texas, I am just an engineer. Thanks Lyndsay. Yes, I have two Ti tags. I use them with my Node-RED setup running on a Pi. 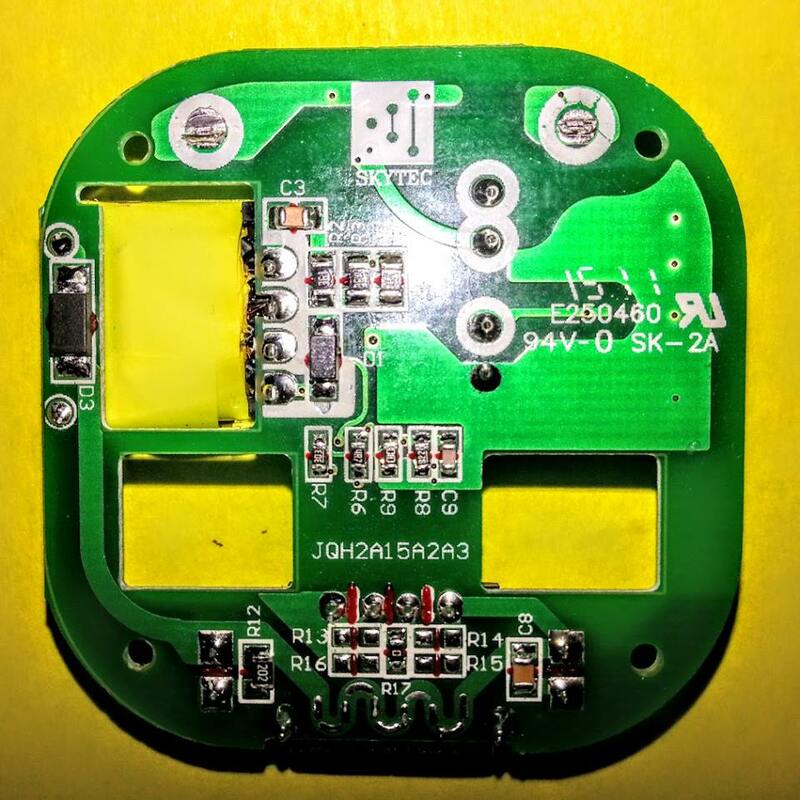 One of them I have tweaked to run off external batteries (a simple bit of double sided PCB the same size as the coin cell, run to some D cell batteries). It can stream its data for years (and counting) at a much higher rate than the coin cell can sustain. I take your point. Thanks for your time to consider the Sense. It's not direct, but it might be able to help. 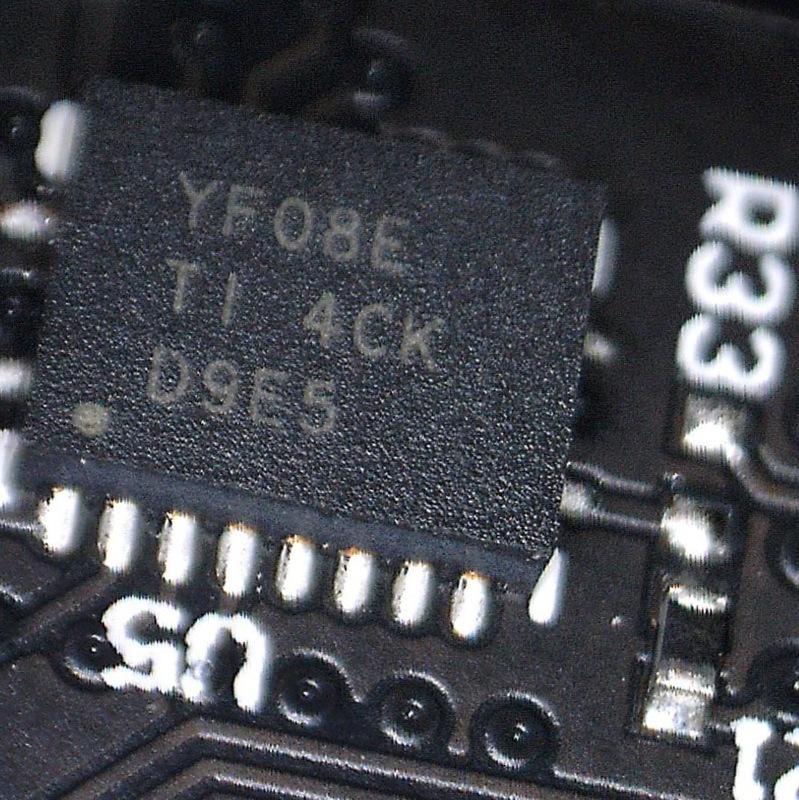 I'd also like to be able to replace the firmware on the TI CC3200 and use it as more. If it were powerful enough it would make an awesome looking Google home/Alexa dot type device. Fantastic teardown review. There are some images with broken links. Would you be able/willing to provide a dump of the SD card, or at least specific instructions on how to tear down? Thanks! @Robbie Trencheny: there's nothing interesting on the sd card, only assets (pcm ringtones) & unreadable logs. For tear down, I'd advise to remove the 4 bottom screws, open, remove the 2 long screws on the sides of the orb, put back the 4 screws (eventually with the bottom), and use them to extract the module from the orb ; the top module is softly glued to the top orb module, but with the 4 screws(& the bottom) you should have enough grip to "unglue". Don't turn the grid ("accoustic mesh") inside the orb, you'll likely tear it. Good luck in your quest. Please do update us if you find a solution. I’m devastated mine no longer works (I only had it a few months before the shutdown). I cannot even go buy another nice alarm clock now because I spent all my saved up money on the Sense :( I understand companies go out of business but the very least they could have done is update us with information like Proud said he would do. It’s unethical to leave us all hanging.